April 17, 2006 ...With two outs and the Sox down a run, Kevin Youkilis punched an Eddie Guardado pitch to the right of diving second baseman Jose Lopez. Youkilis, digging, lunged for the bag. 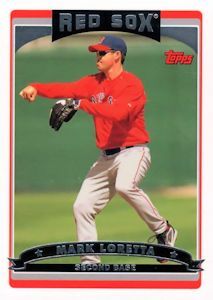 Mark Loretta then stepped up to the plate and would go where he'd never gone before: a) over the Monster and b) out of any park, anywhere, for a walkoff shot. Thus: Sox 7, Mariners 6. Youkilis eventually picked up third base coach DeMarlo Hale and downshifted for the last leg of his journey, which was the only moment yesterday when the Sox were afforded a chance to relax. Seattle had scored, and the Sox answered them. In the first, Ichiro Suzuki snapped an 0-fo-12 in the series, doubling to left and scoring on Raul Ibanez's sacrifice fly. David Ortiz, with two down and the count 3-and-1 in the bottom of the inning, swung through a changeup, then crushed a full-count inside fastball over the visiting bullpen. Troit Nixon, who didn't at all look like a man who'd gone five days without an at-bat, came up with two outs in the eighth, the Sox behind, 5-4, and fell behind 0-and-2. He battled back to a full count and dumped the eighth pitch into right for a double. Jason Varitek, up next, swung and missed at an excellent J.J. Putz splitter to go to a 2-and-2 count, then singled to center, plating Nixon to tie the game. Keith Foulke, who'd worked a 1-2-3 eighth in a mere eight pitches, came back for the ninth and got a quick out. Beltre then popped one foul that Youkilis couldn't come up with. It was a difficult play, as the ball clanged off the wall near the tarp, but it was makeable. Given life support, Beltre singled and advanced to third on a Bloomquist laser single to center just over Foulke's head. Francona opted for Mike Timlin, with runners on the corners and one out and former Sox infielder Roberto Petagine pinch hitting. The infield was in when Petagine grounded one toward Loretta, who made the play but had to dive. That looked to be the ballgame, as Guardado, with a 6-5 lead, was painting corners in the ninth. He fanned pinch hitter Wily Mo Pena swinging at an 88 m.p.h. fastball. He got Dustan Mohr, looking (that's eight K's in his last 11 official at-bats) at what amounted to the same pitch. And then came Youkilis' Patriots Day run and Loretta’s unlikely swing.